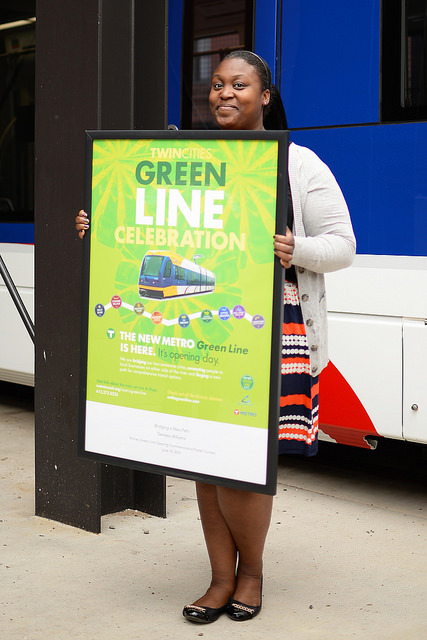 And the winner of Metro Transit's Green Line commemorative poster contest is... drum roll please.... Genesia Williams, a Minneapolis graphic designer. Williams's poster featuring a light-rail car, icons representing rail stops and and the words "Twin Cities Green Line Celebration" and "The New Metro Green Line is Here: It's Opening Day" received the most votes in an online contest. On Thursday, Metro Transit General Manager Brian Lamb unveiled what he called "the defining poster that represents the Green LIne opening" ahead of Saturday's grand opening of the 11-mile line that will run from Union Depot in downtown St. Paul to Target Field in downtown Minneapolis. "It feels good as a designer that something that you have done resonated with the people that the work was there to serve," the 27-year-old said. "I communicated the intended message, and having it look cool is a bonus"
In a ceremony outside the Lowertown light-rail maintenace facilty in downtown St. Paul, Lamb rewarded Williams with a $500 check and a Go-To Card that will allow her to ride buses and trains free for a year. "She did a great job with the poster," he said. Metro Transit held a poster contest earlier this year and more than 40 people submitted designs . The field was narrowed to five and put up for an online vote. More than 2,000 votes came in, and Williams got the most. Postcard size verisions of the winning poster will be distributed Saturday and Sunday during opening weekend festivities. Full size versions are available for sale for $8 through Metro Transit's website.